But if you poke, prod, and nudge enough, you realize that, yes, they actually can and do cook. And quite well, thank you very much — whether they care to admit it to themselves and the rest of the world or not. You may know her work from the glorious photos she used to take for the San Jose Mercury News, for the poignant pics she now takes for her wedding photography business, and for the lovely shot she took of me on my “About” page. Joanne is a professional photographer. She is most gifted and skilled. She takes great pride in the work that she does behind the camera. Indeed, if she — instead of yours truly — had snapped the photo above, it would have looked far more gorgeous than my feeble attempt. Yet get her talking about cooking and she is as bashful as can be. Listen to her words, and she’ll have you believe she can’t make a thing, that turning on a burner is beyond her capabilities, and that her home kitchen is a foreign land she dares not step into too often. But taste her food, and you realize the truth: She sure can cook. Joanne, who is Korean-American, invited me and our other friend, Lisa, over recently for a home-cooked Korean lunch. Together, we make up three-quarters of the Woo Hoo Wednesday Club (the fourth was otherwise occupied). Lisa and I, who are both Chinese-American, took copious notes, since Korean food is not a cuisine we are intimately familiar with. Joanne scurried about in the kitchen, as we peppered her with questions. Her favorite local Korean market? Hankook Supermarket on El Camino Real in Sunnyvale, because she likes its vast selections and its tidy appearance. Her favorite brand of fish cake? Osaki brand. Its fish cake is orange-red as opposed to others, which are more pink. When in doubt, she says, buy the more expensive brand and you won’t go wrong. On Joanne’s menu that afternoon? 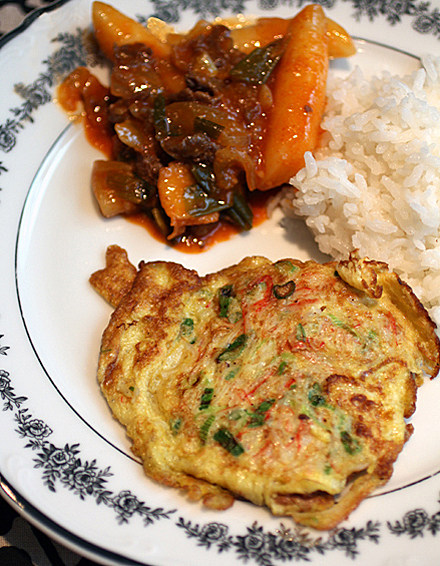 Steamed white rice, assorted kimchi, “Joanne’s Mom’s Korean Omelet,” and “Tteokbokki” (chewy, thick Korean rice cakes tossed with meat in a thick, sweet-spicy sauce). Like so many home cooks, Joanne cooks without really measuring, so the amounts in these two recipes below are a little fluid. The omelet is an easy weeknight side dish that’s cooked like pancakes in a frying pan. Joanne loves eating them dipped in ketchup, too. The rice cakes in the stew are like mochi’s heftier cousin. They are dense and toothsome, and make for a hearty comfort dish. Along with the pickled radish and cabbage, we found our mouths happily a tingle with tang and heat. We gals filled our plates, then loaded up on seconds. When Joanne continued to insist that she doesn’t really cook, Lisa and I just gave each other a knowing glance. Oh, yes, you do. Be proud of it, too. In a large bowl, beat the eggs. Add shredded fish sticks, scallions, salt and pepper, and sesame seeds; mix. The batter should be quite thick. Heat a little oil in a frying pan on medium heat. Drop pancake-shaped spoonfuls of batter in the pan (about 2 tablespoons of batter per small omelet). When the bottom is browned, flip the small omelets over to cook each on the other side. Remove cooked omelets to a serving plate. Cook more omelets the same way until you use up the batter. The omelets can be served warm or at room temperature. Soak rice cakes in water at least two hours. You also can soak the rice cakes overnight in the refrigerator. In a large saute or frying pan on medium heat, drizzle in a little sesame oil. Stir-fry beef in the pan until browned. Add garlic, scallions, white onion, and carrots. Stir to mix. Drain rice cakes, and add to pan. Stir in 1 to 2 tablespoons of the Korean red pepper paste. Add about 1 cup of water, and the sugar. Stir to incorporate. Cover the pan, and let simmer for about 5-8 minutes. The sauce will thicken from the starch from the rice cakes. The rice cakes, themselves, should be tender, but not mushy or flabby in texture. Transfer to a serving bowl and garnish with toasted sesame seeds. Wow, this sounds like the perfect way to spend a Wednesday. What a culinary adventure. We have a wonderful Korean BBQ just down the street, and I am always in awe of the variety of side dishes that come out. Korean is definitely a cuisine I’d love to learn more about. Next time I am in the South Bay, I hope to check in on these places that Joanne mentioned. I love hearing updates on your Woo Hoo Wednesday group. I guess your friend doesn’t really cook the way you don’t really take photos. I think your photos are as stunning. oh I love the spicy rice cake dish – it’s kind of like mac ‘n cheese! Is osaki the same as Japanese Kamaboko? Those things are always nice to have on hand. Noodles + simple broth and you have a meal. Jude: The Korean fish sticks used in the omelet are not quite like Japanese kamaboko. The Japanese fish cakes have a dense, uniform texture, so that you have to slice them. The Korean fish sticks, on the other hand, can be shredded. It’s more like the texture of surimi (or imitation crab). Aw, I was just at Super Kyo Po yesterday to pick up a mackerel for dinner. They also had salted mackerel fillets on ice. Do you think they could be used in your hom yu recipe? You’ve got me all excited to try a couple new Korean dishes. Is the osaki also like fake crab sticks? It sounds kinda like egg foo yong w/o the bean sprouts. 🙂 I have to go find those rice cake noodles too. Are they short, so you don’t cut them up? like skinny mochi sticks? Could you use leftover spicy bulgogi, and then sir in all the other ingredients? Thinking about it is making my mouth water. Please keep the Korean recipes coming. Also, if you have any more of your Mom’s recipes, that would be great! I used to think that I could never cook until I started watching The Food Network and realized that it wasn’t so hard after all. I doubt I’ll ever be able to make anything super gourmet but I can do everyday fare easily now. I still LOVE finding new and unique recipes to try or create my own! Yep! I’d definitely say your friend can cook by the look of these stunning photos. My brother is a professional photographer also. It came in handy for our wedding lol. And yes, the osaki is kind of like fake crab sticks. The rice cake noodles are short, similar in shape but a little longer and thicker than penne pasta. Ooh, leftover bulgogi might be quite good in this. Just be sure to soak those rice cake noodles ahead of time, and to cook them with enough liquid to get them soft. I don’t have too many of my Mom’s recipes, unfortunately. But I’ll hunt around to see what else I might have. Let this be a good lesson for all of you out there: Get your parents or grand-parents to write down your favorite recipes while they still can. You will be eternally grateful that you have them, especially as you get older and start missing those wonderful dishes you grew up with. And Suzy, maybe you and I both can sweet-talk my friend Joanne into divulging more of her Korean recipes. She’s still flabbergasted that I think she can cook. Hah. But she said she was giddy reading today’s post, and that it did give her a little more confidence in the kitchen. And there are those, like me, who love to cook, knows her way around the kitchen, practices quite a bit, reads cookbooks, watches cooking shows, knows a variety of ingredients, owns half of the items available at the Bed Bath and Beyond kitchen section, and STILL can’t get the food to taste good. I guess some have a knack for it and some just don’t! These are fantastic recipes! The omelette looks very yummy! I also have a friend that says “she can’t really cook” but she is actually a very good cook and an amazing baker. Korean cuisine is another I’d like to spend more time getting to know. The omelet sounds delicious especially with the pickled radish on the side. While thoroughly enjoying the post re: reluctant good cooks, I’m grateful most of all for learning of your Woo Hoo Wednesday Club. I’m only sorry for having missed it when it was posted last year but its story remains heart-wrenching and heart-warming. Last September following a week’s vacation I was summoned to my manager’s office where I was basically handed a cardboard box with which to clean out my cubicle so I, like so many others can totally relate to the SJMN pink thing. I thought this episode of Dilbert quite appropos: http://is.gd/1WlMx Did that evoke a rueful smile? You, Carolyn and the other members of the WHWC forged a fab “one for all and all for one” alliance worthy of adoption by the swelling numbers growing each day. That story within your post really made this special — thanks twice! Wotten: The Dilbert strip is priceless, and really says it all. I know there’s no good way to lay someone off, but geeze, to just be handed a cardboard box?? Sigh. You are a true example of how to handle it with grace and head held high. Looks like a great lunch. Tteokbokki brings back fond memories of huddling around a street vendor’s vat of Tteokbokki for heat in the middle of winter with the sweet smell of chillies and fishcake wafting through the air. I think many wonderful cooks genuinely feel that what they do really isn’t that special but those of us who get to enjoy their creations know better! Thank you for sharing your lunch get-together and these recipes.